Sir Isaac Newton, gravity wells, apples and the Dark Side of the Moon – The Diesel-Electric Elephant Company. Don’t sit under the apple tree and change the course of human science with anyone else but me, anyone else but me… The sign didn’t explain where the talking snake was while the apple was falling and why the Mr God then threw young Isaac out of his own garden. Day something-or-other of our wanderings while Cardinal Wolsey is was being blacked (hull blacked, that is, not black-balled or admitted into the High Order of Blick & White Minstrels). Sir Isaac Newton’s home, Woolsthorpe Manor, near Grantham in Lincolnshire. The place felt magical – steeped in history (and none of the history had been washed off or “modernised” or commericalised away). Bucolic landscape – twittering birds, rustling trees, rolling meadows, grass and wildflowers singing to themselves as they grew. What can beat standing in Sir Isaac Newton’s own bedroom, looking out of the window he looked out of, straight at a direct descendant of the very tree under which he was brained by a ripe apple? What a connection to history eh? Just casually wandering about the room where he conducted his experiments with prisms and light – what a privilege, what a secular scientific pilgrimage! Mr Newton was either unaware or cared less than a fig that IKEA could do him a nice window treatment for less than eleventy-three guineas. Mr Newton pictured here without his customary wig. Many, if not most, of the people in Wolverhampton think of the seventeenth century and onwards as a time of dull, beige and sober quietness, but in fact, from 1666 onwards after Mr Newton’s work with light, history buzzed and fizzed to the sound of his Rainbow Gun. Initially, Mr Newton was pleased, pleased that is until his invention led to an increase in the number of brass euphoniums being played. However, after working really hard to make things right again, Newton became the fifth member of Pink Floyd and wrote Dark Side of the Moon, so all was forgiven. Alright, alright, I am finished with my tacky jokes (“jokes”) section. Back to the serious world of Woolsthorpe Manor. Sitting in Newton’s garden on a sunny summer’s day (and, no, in England “sunny summer’s day” is NOT a tautology but more of a rarity)! This is one of the eighteen-thousand two hundred and seventy-six top reasons why I love England. Where else could you just wander along to a scientific giant’s old birthplace and family home, cough up half a dozen quid each and then wander in to gawp at liesure? The estate is really tastefully managed, with coffee (and cake) room hidden away in one of the barns and an interactive display for part-formed, untamed, smelly humans (i.e., children) – also hidden away from the main building. 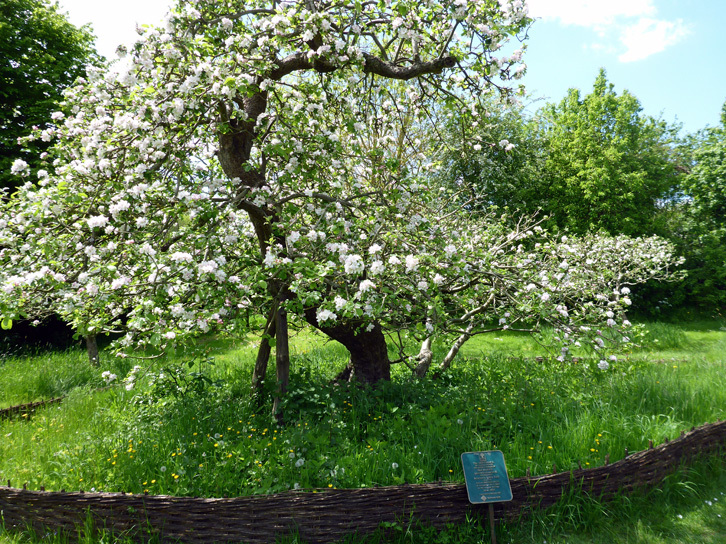 Visitors can also hang about in the wholly unsupervised garden wherein grows a descendant of a descendant of a descendant of a descendant of the actual, genuine, real apple tree in question – how brilliant is that? The house itself – no “tours”, just a couple of knowledgeable guides dotted around, happy to answer questions and watching that visitors don’t run off with any of the larger laws of motion, or tuck the original copy of Principia into their bag. Relaxed, human, thoroughly enjoyable. Mr Albert Einstein called in to visit – not while we were there though – to pay his respects to the spot. I would say when he visited, but it doesn’t really matter, since time is all relative. Folk weren’t shorter in those days, they just didn’t lie down full-length to sleep, sleeping propped up instead for health and anti-snoring reasons. Once again I found myself in the position of having to restrain the Bro from violence and mayhem, while simultaneously explaining that, no, it’s just that Steve’s had a hard life whereas I have been cosetted in the lap of luxury and privilege for most of mine*. The custodians of the Newton place are an august body going by the name of the The National Truss, so we don’t have an individual or more approachable FaceBook of Twitter presence, just the major all-encompassing one. Would I recommend a visit? Ab-so-lutely yes. The history there is momentous, stupendous, mind-boggling. The establishment well-run, relaxed, tasteful and generally spiffing. I’ve sat in Sir Isaac Newton’s garden! I’ve poked around his house and his bedroom/study! I’ve eaten cake and swilled coffee where his family used to keep their cows! All while trees rustled, birds twittered and where someone thought that I looked a lot, lot younger than my bro! As far as I am concerned, if you don’t know who Sir Isaac Newton was then you don’t deserve to stick to the floor. I will leave you with the Newton coat of arms; crossed bones. A coat of arms so very similar to the Hutson arms, ours being crossed spoons with bezants grand and badgers rampant. It occurs to me however that, had the coconut tree been as popular in England as was the apple tree, Mr Newton might have formulated his great theories only for his cerebral lights to go out permanently almost immediately afterwards. Wheeeeee… ‘Aha, now it all makes sense!’ … Splat! – ‘Oh, I’m dead!’ Result; no Newtonian physics, not never. Once again, the English climate is responsible for so very much that we may be grateful for. Previous Newark Air Museum – just a load of old aeroplanes really. Splendid!